Published on February 1, 2018 in Allenatori, Calcio, Generale, Giovani and Mental coaching. 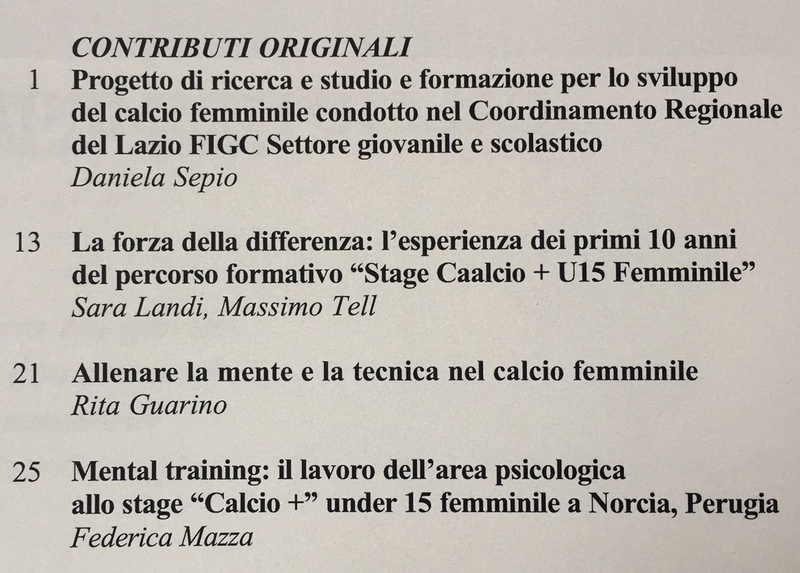 0 Comments Tags: Daniela Sepio, donne, Federica Mazza, FIGC, Massimo Tell, Rita Guarino, Sara Landi, women. Published on October 23, 2017 in Allenatori, Giovani, Mental coaching, Stress and Tennis. 0 Comments Tags: allenamento., donne, ITF, ranking, WTA. In Italy we have a problem in Female tennis, because we not players among the top 50 in the world ranking and only y2 two among the top 100. A disaster and, above all, the inability to build a winning movement starting from the successes of the gold cycle of Pennetta and company. Beyond organizational matters and the early introduction of young in the tournament circuits, I am convinced that one of the aspects limiting the development of tennis players is the lack of integration of psychological component in training and in physical preparation. Tennis is a complex sport in which physical reactivity protracted in time, mental readiness and determination and technical-tactical skills are used during each point. I wonder, too, because there are no data about but only personal experience, if these components are trained by coaches with the same determination that is then asked the players. In my opinion, this approach is flawed, the girls (but this is also true for males)pay much more attenzione to hit the ball and to win the game rather than being tough and determined. My question is: how much time is dedicated in training to build the toughness and determination compared to the time devoted to the development of the technique and game? I remember the words that Roberta Vinci was repeated while playing the game, then won, against Serena Williams: “run and throw it in there.” In other words, she continually motivated to be focused on the present. How many training sessions are conducted with this approach? The winning mentality is not formed at a table but through a coordinated training on these aspects. The same is true for the physical preparation of the tennis player how much care is given to stimulate attention, motivation and toughness during the sessions? In my opinion, there is not attention at these aspects, except maybe one that spontaneously the coach and the athlete can take. This approach to training requires close collaboration between physical coach, psychologist and coach. There are people with this kind of interest? Published on May 9, 2017 in Generale. 0 Comments Tags: Camminare, donne, genere, review, uomini. Walking is associated with better mental and physical health and reduced mortality and, when used for transport, with reduced air and noise pollution. In contrast to other forms of physical activity, walking has the advantage of being accessible to most people. For these reasons, promotion of walking has become more prominent in public health campaigns . The aim of this systematic review is to assess the current evidence on gender differences in walking in high income countries. We hypothesised that there are gender differences in participation in walking for leisure, for transport, and in total walking. We also set out to examine whether gender differences change across the life-course. More women than men walk for leisure when all age groups are considered together, although the effect size is small. At younger ages more women walk for leisure than men but that this gender difference diminishes progressively with age, with evidence that it reverses in the oldest age groups so that more older men than older women walk for leisure. Walking for exercise found that more women walked than men, except in the oldest age group (60+), in which more men walked than women. Data on walking for fun or pleasure found that more women walked for fun than men. There is no evidence for a consistent gender difference in participation in walking for transport. There was no evidence for a gender difference in the prevalence of walking for any purpose in studies including all ages from the USA. Data reported by age group suggest that at younger ages more women walk than men, but at older ages the gender difference is very small. Walking for leisure is an activity that women can undertake with children and it is possible that child-care plays a role in the relatively high levels of walking for leisure in younger women. Young men’s relatively high levels of participation in sports and exercise decline with age, as reported for the UK and the USA, and it is possible that men adopt walking for leisure as a replacement for more vigorous activities as they get older. In the oldest age groups, the proportion of men walking for leisure declines, but the proportion of women walking for leisure declines more. This pattern may reflect differences in ability to walk in older age. A British study found that “mobility limitation” rises faster with age in women than in men, probably because of higher levels of morbidity in older women than in older men, including musculoskeletal problems. 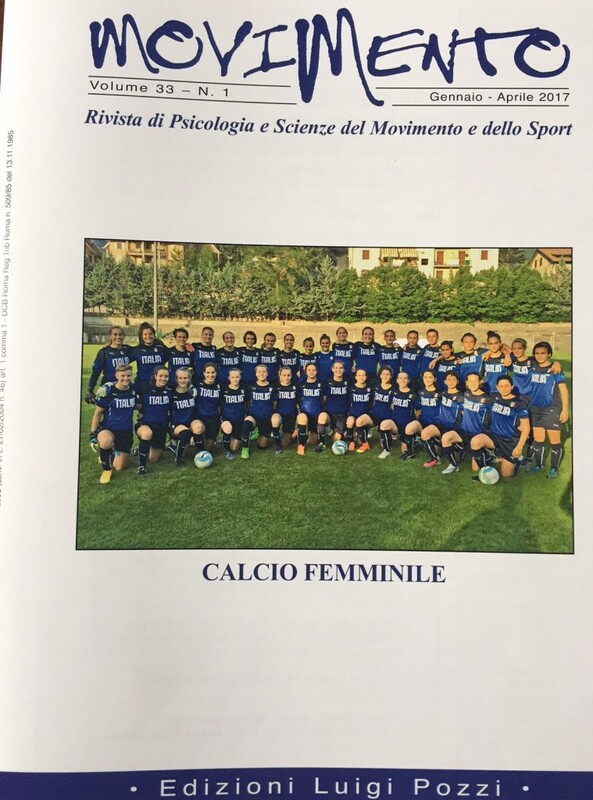 Published on April 1, 2015 in Allenatori, Calcio, Corsa, Generale, Giovani, Mental coaching, Olimpiadi, Stress, Tennis and Tiro a volo. 0 Comments Tags: business, donne, fiducia, manager, resilienza, tenacia..
Research conducted by McKinsey&Company on the success factors of women holding management positions showed that at the basis of their success there are features such as resilience, toughness and confidence. It’s not surprising because these are the basic characteristics of those who succeed in any field, including sport. Based on these features you can build great careers in business as in sport or art. Without the road will be short. “Many women’s programs focus on convening, creating, and broadening networks. While these are important investments, they are insufficient. Companies should also instill the capabilities women need to thrive. Some of the most important are resilience, grit, and confidence. Resilience is the capacity to recover quickly from difficulties—a form of toughness. Grit is resolve, courage, and strength of character. Confidence is a level of self-assurance arising from an appreciation of your own abilities or qualities. In business settings, resilience allows us to get up after making a mistake or encountering a challenge, grit allows us to push through walls and rise above challenges, and confidence helps transform challenging experiences into greater self-assurance, not self-doubt. Published on January 21, 2015 in Generale and Olimpiadi. 0 Comments Tags: donne, genere, Londra, medaglie, stereotipi, uomini. If countries are hoping to come out on top during the 2016 Summer Olympic Games in Rio de Janeiro, they better start minding their gender gaps. According to a new study by the University of British Columbia, countries with more gender equality tend to win more Olympic medals. “I think there’s a stereotype that more macho nations that valorize masculinity or male dominance might be more dominant in male sport, we found that it’s actually the opposite,” says lead author Jennifer Berdahl, a professor of diversity and women’s studies at the UBC’s Sauder School of Business. Berdahl studied 121 countries using data from the World Economic forum’s 2013 Global Gender Gap Report and compared it with the medal counts for the 2014 Winter Olympics in Sochi using a statistical model that controlled for factors such as GDP, income inequality and population size. Her findings reveal that both women and men tend to win more medals if their country exhibits greater gender equality, especially when it comes to educational attainment. To corroborate her conclusions and account for countries’ performance differences in the winter versus summer games, Berdahl also studied the 2012 Summer Olympic Games in London and found the same results. The findings contradict society’s belief in what Berdahl calls a “zero-sum game” when it comes to gender rights, which is the idea that affording more opportunity to women tends to limit opportunity for men. Published on January 17, 2015 in Generale. 0 Comments Tags: attive, ca, donne, girl, mo, mov, movimento, sport england. This Girl Can is a sassy celebration of active women everywhere and proves that whatever our size, ability or previous experience, sport can be a fun and enjoyable part of our lives. It is a national campaign, developed by Sport England and delivered in partnership with a wide range of organisations, to the persistent gender gap which means that more men play sport than women at every age. Published on September 6, 2014 in Generale and Giovani. 0 Comments Tags: donne, empowerment, gisere, misty copeland, motivazione. #IWillWhatIWant is not only a commercial that advertises a famous brand of sports but is part of a campaign of Under Armour to support the women empowerment. The protagonist of 1 minute video is Gisele Bündchen, during an hard training to pungiball. Another video has instead as a testimonial the dancer Misty Copeland. I think it’s a brilliant campaign, which is placed in a broader context of actions carried out by this company. The other campaign that promoted is called Protect This House. I WILL talking about the house of sport. Published on July 7, 2014 in Calcio, Giovani and Young and Football. 0 Comments Tags: Calcio, donne. The language used on a daily basis with the kids on the football field (… run like sissies, … you are a sissy!). Published on March 7, 2014 in Generale. 0 Comments Tags: CEO, Debbie Evans, donne, rugby. “Women in sport is not rocket science. Women make up 50% of the population. Ignoring one half of the talent pool in this country does not make good business sense. Getting more women into senior positions in the sports industry is not a “female thing”. It is just common sense. The fact that our Rugby World Cup team is 50% female is great and is a result of interviewing widely and recruiting the best people – men and women – for the job. The barriers so often cited as reasons why women cannot progress in their careers, such as motherhood, are outdated. The workplace is changing. It is dynamic and flexible. In a modern world it needs to be. The leadership of any ambitious organisation has to be open-minded. … UK Sport and Sport England set a target for all sports governing body boards to be made up of 25% female directors by 2017. For most of my life I have actively disagreed with targets and quotas for women but where a target can be helpful is that it shows ambition. And that is important. Is 25% ambitious enough? I do not think so. Surely we have to be aiming at 50%, to reflect the population. I am absolutely not saying give women jobs for the sake of it. I would never advocate that. But I do think we need to create the opportunity for women to shine. And that is about sports organisations proactively encouraging women to join their workforce. Seeking out female talent when they are recruiting. The talent is out there, the problem is that too often the default position is to see jobs in sport as male. When you think of the many remarkable women working in British sport right now that attitude is misplaced. Just look at the talented women on this list. … I believe that being an athlete has given me an essential skillset that translates into running an organisation. That is not just my view, a report published in America last year told a compelling story of women with sports backgrounds – from Hilary Clinton to Christine Lagarde – reaching senior positions in their industry. Published on August 21, 2013 in Generale and Giovani. 0 Comments Tags: dirigenti, donne, europa, formazione, impianti sportivi. For the first time in Italy it will be organized a free course concerning “The value of the difference in the management of sport” of 224 hours, including classroom training and internships, reserved for 18 participants organized in Rome by ‘Tor Vergata University in collaboration with Federculture and Sportlink. The course aims to prepare future leaders and women leaders, through the transfer of knowledge and skills to enable the participants to enter the world of sport work with managerial responsibility in various areas of planning, organization, management and evaluation of services and facilities for physical activities and sports, from the recreational to professional. The course will address complex issues, such as strategic management, marketing and communication aspects, the notions of law, contract law and taxation, principles of management control, in addition to the optimization of planning and operating costs, by acting on the principles of energy saving and increasing revenue sources. At the same time, the course aims to create a professional and innovative, transferring specific skills in project management of sporting events in support of local authorities, especially of medium and small cities which do not have on their staff specific competences in the organization of sport events, in all their phases.